Smart Search Marketing is a full service digital marketing agency specializing in B2B marketing. They are full funnel, they move prospects into and from awareness and through the sales cycles. Patricia Hursh, the VP of Client Delivery, had tasked a team to discover ways to help improve client reporting. After checking out reviews on sites like G2 Crowd they created a short list, went through several demos and eventually decided NinjaCat was an industry leader who had the perfect reporting solution to suit the needs of Smart Search Marketing. To Smart Search Marketing, client reporting is key to keeping happy clients and showing them the value Smart Search brings to the table. One or their primary goals was to transition from merely displaying data to highlighting strategic business insights. NinjaCat is helping them achieve that goal. Automation, consistency, data accuracy, templates, API integrations and saving time were all key points that needed to be addressed with solutions. Smart Search Marketing wanted to be able to deliver strategic, actionable business insights to their clients through the reporting process. A secondary goal was to unite their departments on the same page of the story as it pertains to clients and client reporting. Consistency was key to moving forward, as was redirecting time spent on reporting towards talking with clients. Last but definitely not least, they wanted to move away from ‘reports’ and deliver stunning presentations each week or month that provided actionable, intelligent insight to their clients. 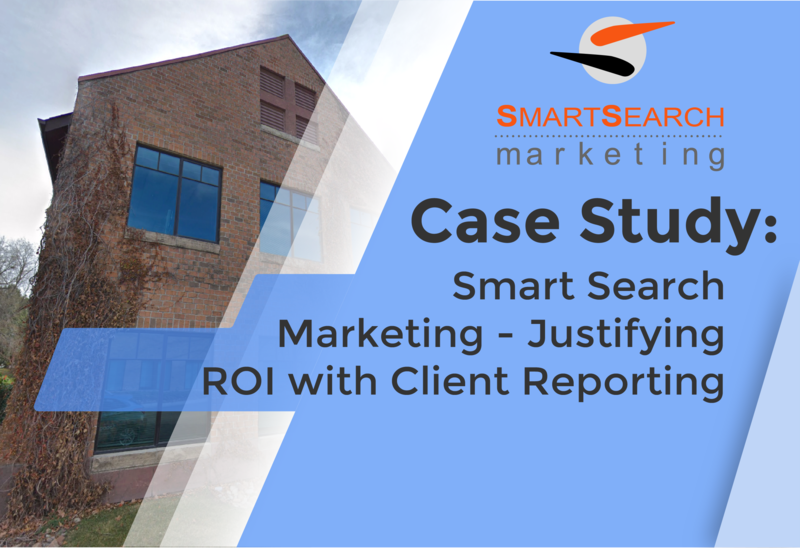 Given the goals Smart Search Marketing was striving to attain, the desired outcome was to increase the amount of dollars managed by the client services team and grow the business without incurring increased overhead costs or detained reporting cycles. Smart Search Marketing is now transitioning to a more insightful reporting solution for their clients. They took all the steps necessary to secure a solid reporting solution that would benefit the analytics team, client services team, management and their clients. The solution scales well with the way Smart Search Marketing is growing and the new reports impress the clients. Adding new modules upon request is quick and simple. Having a growing list of integrations has made the reports very flexible to the different KPIs they track per client. Management has been able to determine the most effective KPIs clients and client services should be having conversations about. This has allowed for the client-agency relationship to focus on strategic feedback and actionable insight on campaigns. In turn, that has led to better client conversations, that has opened up more investment for new and different campaigns. It has also illustrated the importance of having Smart Search Marketing on the roster. The analytics team feels they are well equipped to collect the data, create dashboards and run weekly, monthly or ‘on-demand’ client reports. Client services has more confidence when going into strategic discussions with clients. The whole team has seen an improvement of efficiency and effectiveness and all parts are now moving towards delivering high quality strategic insight. NinjaCat is not just a reporting solution for digital agencies. NinjaCat can have positive effects on several areas of your business. 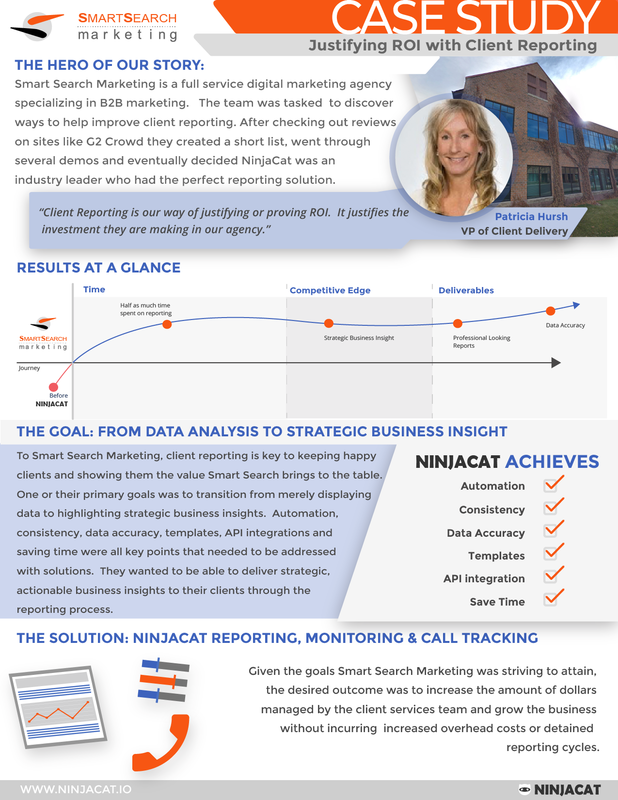 Your analytics team is confident in the data accuracy, client services can bring home bigger clients, get existing clients to add more digital services and management doesn't have to hire an expensive reporting team.. Take the NinjaCat test and see if our solution is exactly what you and your clients need. Sign up for our quick demo and see the potential of the NinjaCat reporting solution for digital marketing agencies. Client reporting is a great way to justify ROI. Marketing is an investment into the growth of your business. Reporting shows your value to clients.